Katie Gardner, Teacher Programs Developer at Liberty Science Center is a geologist, and oceanographer. She is passionate about Earth, gaining interest in sharing that enthusiasm as an NSF GK-12 graduate fellow. She holds a B.S. in geology from Florida State University, attended the University of South Florida, for master’s work in oceanography, and holds a M.Ed. from Lesley University in STEM education. Katie has taught thousands of students and dozens of teachers across all disciplines of science in a variety of different formats. She develops exciting lessons and presentations for many different audiences. She co-taught COSIA, a science communications course at Rutgers University focused on providing science students with the skills to share their science with general audiences. She has also provided professional development in communication techniques and educational pedagogy to informal educators. 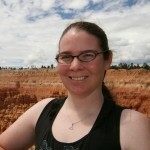 She is currently involved in engineering and computer science education, as well as sharing techniques for integrating technology and data usage into classrooms. Make connections between the physical characteristics of an environment and the organisms that inhabit it by having students engage in a kinetic game interpreting ocean temperature data while role playing a fish with specific physical water requirements in a game that simulates one year in time. Using ocean data products, students will explore the relationship between seasons as we observe them on land and seasons in the ocean. Working in pairs or small groups, students will be challenged to explain the differences and similarities seen within the ocean data to their experiences with continental seasons.